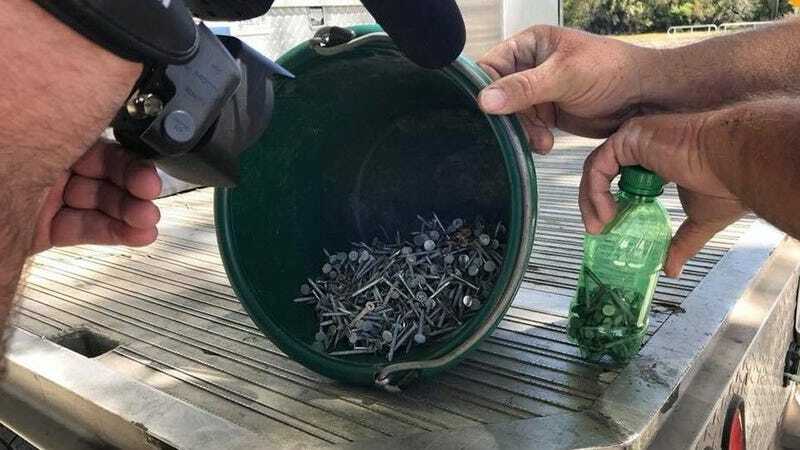 The nails have been responsible for flattening a number of tires, include one belonging to the wife of Oak Hill Mayor Doug Gibson, Fox 25 Orlando reported Thursday. “The issue to me is safety,” Gibson said. U.S. 1 runs through Oak Hill for about two miles. Gibson ordered the purchase of three magnetic rollers to scoop up the nails. So far hundreds have been collected. I mean, I get that living in a town of two thousand or so (and the “hill” is barely 13 feet ASL) is boring, but this seems like a poor choice of entertainment.